The incredulous looks of the neighbours and onlookers as we dug up the turf of the front lawn had to be seen to be believed - some thought we were inspired, the majority withheld judgment (declined to admit their scepticism). 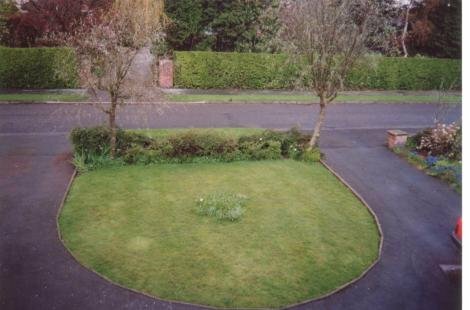 The cherry tree in the centre of the lawn had been removed some 10 years earlier and the two laburnums, wonderful for 2 weeks a year were also removed. The turf was loaded into the trailer and taken up the garden to be covered upside down in a turf pile. The potentillas planted in 1988 alongside the wall were moved to other areas of the garden, and the whole area turned and as ever buried in home made organic compost. 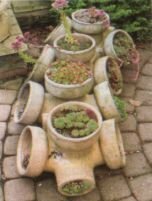 Following careful planning and discussion the plants (still in their pots) were arranged in the area, their positions noted and then they were removed. 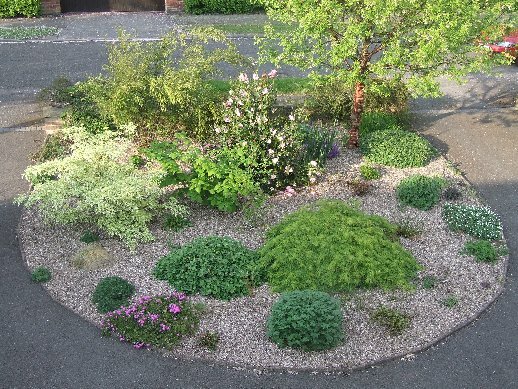 A layer of mypex was laid to control weeds and keep the gravel on the surface and the potted plants returned to their agreed positions before being shuffled about a bit more. Plants were inserted though the mypex and several tons of pea gravel spread was over the top. The following two images show the before state. Delicious home-made cakes with tea or coffee available. 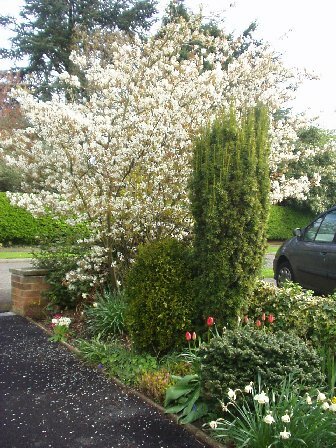 Entrance £4 children free, all takings (entry, teas and plants) to the NGS.